Even if you don’t know much Arabic you have probably noticed that a lot of Arabic names contain the words “Al”. Even a lot of non-Arab Muslims have these two letters in their name. So what does this word mean that is seeminlgy in every Arab name? Far from being the equivalent of “Joe” or “Smith”, this is in fact not a proper name, but a particle that indicates a certain meaning. “Al” (ال) literally translates as “the”, i.e. it is the definite article in Arabic. For example, kitaab (كتاب) means book and al kitaab (الكتاب) means “the book”. It can also mean “of the”: for example, lawn al kitaab (لون الكتاب) means “the colour of the book”. In names Al is generally used to identify the origin, profession or character trait of the bearer of the name or his family. For example, Ahmed Al Masri (أحمد المصري) would translate as “Ahmed the Egyptian” (“Masri” means Egyptian), whereas Ahmed Al Yemeni (أحمد اليمني) would be Ahmed the Yemeni. A person’s profession or that of his father or grandfather is also frequently used as a last name, such as Yakoub Al Jarrah – Jacob the Surgeon. Occasionally, Al is used with character traits to form a last name. For instance, Salim Al Dhaki (سليم الذكي) would mean Salim the smart one. Sometimes Al is also part of the first name of a person. For example, the famous Arab Saladin is in fact spelt Salah Al Din (صلاح الدين) in Arabic, which means “righteousness of the faith”, with the al being “of the”, Salah being “righteousness” and Din meaning faith or religion. Other examples are Abdulrahim (which could be transliterated as Abd Al Rahim), which means “servant of the Merciful” (with “the Merciful” being one of the names of God in Islam). “El” is sometimes used instead of “Al”. It has the same meaning and the Arabic writing is in fact the same. The difference in spelling in English is merely due to the fact that sometimes Arabic speakers pronounce certain sounds slightly differently from one another. El is predominantly the pronunciation of this word in Egypt and some other North African countries, while Al is usually used in the Levant and Gulf region. Frustratingly, one can sometimes find “La” as an alternative pronunciation for “al” in the Maghreb region (Tunisia, Algeria, and Morocco). Confusingly, the Al in Arabic names oftentimes doesn’t mean “the” at all, but refers to a different word altogether, which is spelt differently in Arabic with a sign elongating the letter ‘a’ (آل), but transcribed in the same way in English. This second Al is pronounced with a long “a”-sound, so I will transcribe it as Aal here to avoid confusion, even though you will usually find it transcribed simply as Al. So, what does Aal mean? Well, it means “family”, “clan” or “tribe”. 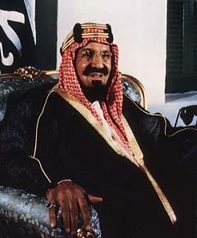 The founder of modern Saudi Arabia is called Abdelaziz Aal Saud (عبدالعزيز آل سعود), which shows that he is from the Saud tribe. Coincidentally, the first name Abdelaziz is an example of the first type of “Al”, meaning Servant of the Mighty One (i.e. God): Abd Al Aziz. Other examples: the former Emir of Qatar Hamad Aal Thani is from the Thani tribe. The third chapter in the Quran is called Al Omran, which means “family/tribe of Omran”. This entry was posted in Culture, Learning Arabic and tagged al, arabic names, clan, definite article, el, family, the by ArabicGenie. Bookmark the permalink. I am trying to learn the Arabic alphabet and finding it rather difficult. I am wondering if Arabic linguists and scholars have tried to simplify it. For example, just use the form of the isolate case and not use the other three forms (initial, middle, and end positions)? Of course, if these other forms occur in the Koran, I can see why it has not been done and I will do my best to learn it. Hi Marcel! I’ve never heard of any such attempts at simplifying the Arabic alphabet. I’m afraid you’ll have to learn all the shapes. But, there are some shortcuts. You need to focus on *why* the letters change their shapes depending on their position. For example, the “tail” at the end of the letter ‘meem’ gets “cut off” if the letter is connected to the left. The reason: it would be too cumbersome to go all the way down with the pen and then up again to connect to the next letter. For more tricks like this, you can take a look at the method I describe here for learning the Arabic script. What does meaning of Nadhavi Ahamed? What does meaning of Nadhvi Ahamed? MY NAME IS SAUD AND I AM LAUNCHING MY BRAND BY THE NAME OF AL-SAUD. IS IT SUITABLE? REPLY ME ASAP! May I know the meaning of Joan from Arabic? Or Joan in Arabic name? What does “embadek” mean? Like when someone gets a new home, you say “embadek!” And how do you actually spell it? !